The basics: 38.6 metre Jetsetter is the maiden launch from Dynamiq yachts. 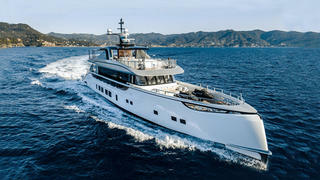 She is making her American debut in Palm Beach, where visitors will be able to explore her four-cabin layout, which provides accommodation for up to ten guests. Standout features: Dynamiq claims that the sundeck on Jetsetter offers the same amount of relaxation space as you would find on an Amels 180. A Jacuzzi and adjacent exercise bikes mean guests can quickly switch from a workout to a relaxing soak. The basics: The 38.6 metre motor yacht Sarita Si was built in steel and aluminium by Italian yard CRN to RINA class and MCA coded, with delivery in 1979 with refits in 2009 and 2014. 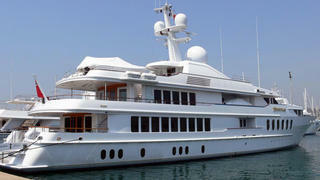 A popular charter yacht in both the Mediterranean and Caribbean, she accommodates 12 guests in six cabins. Standout features: A large and comfortable saloon can be used either for dining or simply sitting back and relaxing. The saloon features an entertainment centre with all modern satellite television and communication systems. The basics: The 44.2 metre motor yacht M3 was built in GRP by US yard Intermarine to a design by Luiz de Basto and, ABS classed, was delivered in 2002 with an extensive $3 million refit in 2016. Standout features: Accommodation is for 10 guests in five cabins consisting of a master suite, VIP suite, two doubles and a twin, all with entertainment centres, LCD television screens and marble en-suite bathroom facilities. 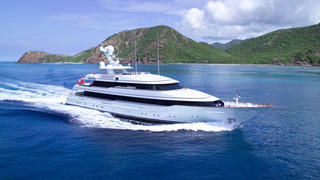 Twin 2,250hp Caterpillar diesel engines give her a cruising speed of 12 knots and a range of 2,600 nautical miles. The basics: Launched in 1997, this 47.24 metre yacht, built in GRP by American superyacht builder Christensen to a design by Glade Johnson and Donald Starkey, had a major refit in 2012 that reconfigured the decks and updated both her interior decor and equipment. *Standout features: * Although Abbracci may be considered a classic, her interior has a modern vibe with lighter wood and fabrics and a large modern galley with stainless steel appliances. Accommodation is for 11 guests in six cabins and up to nine crewmembers who enjoy a spacious crew mess. The basics: The 49.35 metre motor yacht Te Manu was built in steel and aluminium by Italian yard Codecasa to Lloyd’s class and MCA compliant, and delivered in 1998 with a full refit in 2004. With an excellent charter record behind her, the interior by Franco and Anna Della Role accommodates 12 guests in six cabins. These consist of a master suite and VIP suite on the main deck with two doubles and two twins below, all with entertainment centres and en suite bathroom facilities. Standout features: A special feature is an elevator that links all four decks, making her wheelchair-friendly. The basics: The 49.68 metre motor yacht Casino Royale recently had a $1,050,000 price reduction, making her even better value than ever. Built in GRP by US yard Christensen to ABS class, she was delivered in 2008 as the largest yacht in the yard’s Millennium Edition series. Standout features: A lavish interior by Carol Williamson accommodates 12 guests in six cabins consisting of a main deck master suite, a full beam VIP suite, two doubles with queen sized beds and a further two twins, all with entertainment centres, satellite television screens access to the Kaleidescape on demand video and audio server, and en suite bathroom facilities. The basics: The 49.93 metre motor yacht Wabi Sabi has exterior and interior design by Donald Starkey, and was built in GRP by US yard Westport to ABS class and MCA compliancy, and delivered in 2011. A $2.5 million refit in April 2016 saw her receive a full repaint and her five-year class survey. Standout features: She has a unique, versatile layout accommodating up to 18 guests in eight cabins consisting of a master suite on the bridge deck, a VIP suite and a twin cabin on the main deck, and three doubles on the lower deck. In addition, the library can convert to a further double, as can the gymnasium, and all have full en-suite facilities. The basics: Launched by Christensen in 2016, Silver Lining is a 50 metre displacement yacht with interiors by Carol Williamson. Accommodation is for 12 guests in six cabins, while the crew quarters allows for a staff of up to 10 people. Standout features: Her upper deck saloon spreads across the entire nine-metre beam, nudging the total interior volume above the 500GT mark. 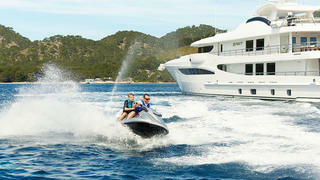 Power comes from a pair of MTU diesel engines for a top speed of 17 knots. The basics: Launched in 2000 by Dutch superyacht builder Feadship, 50.29 metre _Broadwater _has emerged a new yacht from her most recent refit carried out in 2016 at Lauderdale Marine Center. Her new contemporary interior, transformed with new furniture, parquet flooring and grey finish on bulkheads, was created in cooperation with designer Adam Voorhees, the winner of the 2010 Young Designer of the Year Awards. Upgrades also include new decking, a new Awlgrip paint as well as technical improvements and the addition of a beach club guest area in the former lazzarette. Broadwater’s six cabins, which include a full-beam master suite on main deck adjacent to a VIP, accommodate 12 guests comfortably. Standout features: Available for charter, Broadwater also boasts an exterior gym and a 250 wine bottle refrigerator, an eye-catching feature in the formal dining room on main deck. The basics: This 52.7 metre yacht was built in steel and aluminium by Swedish yard Swedeship in 1986 to a design by Dutch studio Diana Yacht Design, was rebuilt in 2003 and had another refit in 2008/2009 to upgrade systems and refresh the interior conceived by American designers Dvorine Associates. She also received a new paint and zero-speed stabilizers. Standout features: A successful charter yacht, Passion accommodates up to 12 guests in six cabins, including a full-beam private owner’s suite with study on the main deck, adjacent to a VIP cabin. A second VIP cabin is on the lower deck where a steam room and gym, which converts to a staff room as needed, are also located. 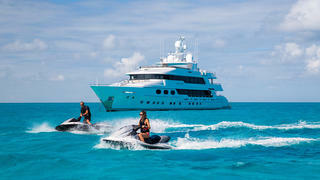 The yacht can take a crew of up to 14. The basics:Spirit is part of Dutch superyacht builder Amels’ 177 Limited Editions series designed by Tim Heywood. Built in steel and aluminium with custom features, she was launched in 2011 boasting an elegant modern interior by Nuvolari Lenard with styling touches by Christian Liaigre. Accommodation is for 11 guests in five finely appointed cabins, including a master suite with “emperor-sized” bed. 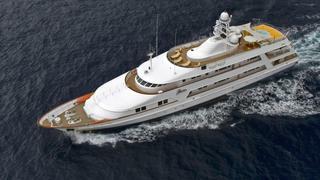 She accommodates a crew of 13. 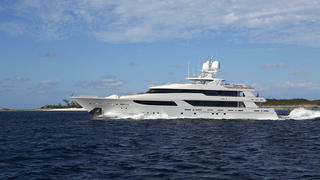 Spirit is currently available for charter. 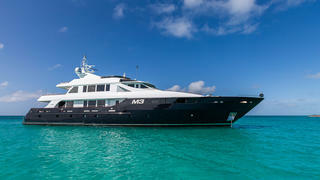 Standout features: Her Zen-like ambience is in keeping with the on board spa and massage room. For entertainment, her skylounge is fitted with an 85-inch plasma screen. The basics: A recent example of the work of Italian shipyard Admiral, 55-metre Quinta Essentia is an all-aluminium yacht launched in 2016. Styling is by Dobroserdov Design and the luxurious interior, inspired by Italy’s region of Tuscany, is by Italian designer Michela Riverberi. Accommodation is for up to 12 guests in five themed cabins, all en suites, including two full-beam panoramic VIPs. 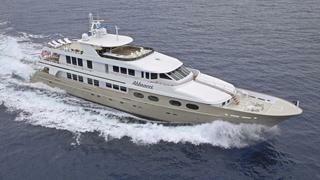 The crew of up to 14, including the captain, is accommodated in seven cabins. 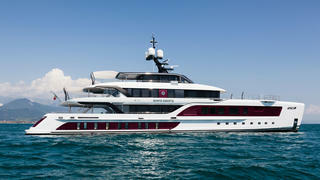 With naval architecture by Vripack, the yacht is equipped with a hybrid diesel-electric propulsion system. Standout features: An outstanding beach club with sauna and spa occupies a good portion of the lower deck, an eye-catching feature along with fold-down balconies and a pool with waterfall. This yacht also has a helipad, situated atop the tender garage, which is large enough for a Castoldi 18 jet tender. The basics: This 55-metre steel and aluminium Feadship, built to a design by Terence Disdale, was launched in 1997 and had major interior refresh in 2005. Graced with large windows offering superlative views from the main and upper decks particularly, this high volume yacht accommodates 10 guests in five luxurious cabins with Disdale’s signature rounded edges, including a master suite on the main deck with its own private observation lounge. Crew accommodation, which includes a nice size mess, is for up to 13. 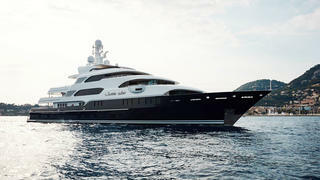 Standout features: A gym, Jacuzzi, sauna, indoor and outdoor dining, plus shaded bar are among the attractions on board. The basics: Built in steel and aluminium by Dutch yard Feadship to a design by De Voogt Naval Architects and Lloyd's classed, Madsummer was delivered in 2005. Her 2015 refit saw the original Redman Whiteley Dixon interiors replaced by a new Laura Sessa design. Accommodation is for 10 guests in five cabins, all with individual décor and full en-suite facilities. Standout features:Madsummer boasts large open deck areas, ideal for lounging, sunning, entertaining, dining, simply relaxing in the Jacuzzi. Her large collection of water toys includes two Castoldi jet tenders, two Yamaha Waverunners, two sea kayaks, scuba diving equipment and a Bauer dive compressor with Nitrox system. 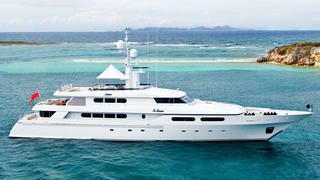 The basics: Built in aluminium by US superyacht yard Trinity Yachts, delivered as Mi Sueño in 2010 and updated in 2015, Skyfall features a warm, modern interior by Patrick Knowles that includes a spectacular foyer/wine tasting lounge aft of a spacious saloon with comfortable seating and a 50-inch home theatre TV screen. Standout features: Formal dining for 14 guests is available inside and out, and Trinity’s signature slip-level master suite is one of seven comfortable guest cabins with flexible accommodation for up to 17. 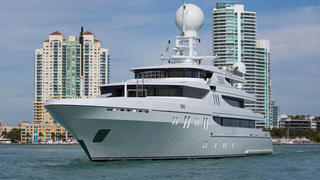 In addition, the yacht has cabins for up to 14 crew. 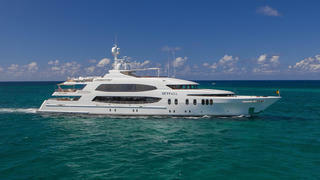 Wheelchair accessible, Skyfall, has an elevator and a helipad for an EC130 or similar craft. The basics:Double Down, a custom build in steel and aluminium, by Italian yard Codecasa to a design by Franco and Anna Della Role, was launched in 2010 and had a refit in 2016 that updated technical areas, entertainment systems and her interior décor. Her five decks boast spacious cabins accommodating up to 19 guests, including the spacious king-bedded suite on the private owner’s deck. A captain’s cabin and nine crew cabins accommodate up to 20. Standout features: A spacious garage for toys, a sheltered dining table for outdoor dining on the bridge deck and a private sun deck with Jacuzzi are among her key assets. 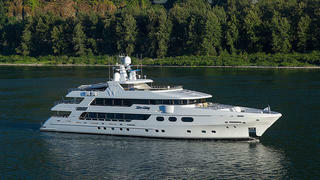 The basics:Martha Ann is an outstanding example of the work of German yard Lürssen and Espen Øino International. Launched in 2008, she had a refit in 2016 that brought this favourite charter yacht back to like-new condition. Her classical François Zuretti interior featuring burl and marble accommodates up to 18 guests in eight luxurious cabins with flexible arrangement, including a split-level suite on main deck. 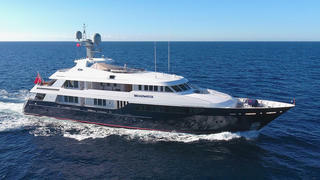 She can accommodate up to 22 crew, including the captain. Standout features: Outstanding entertainment spaces include a swim-up bar on bridge deck, movie theatre, a very completely equipped gym and a large collection of water toys.